My first heresy says that all the fuss about global warming is grossly exaggerated. Freeman Dyson. "Freedom is the freedom to say two plus two equal four. If that is given, all else follows"
1) Scepticism about the usefulness of computer models amongst scientists like Freeman Dyson (recognised as one of the greatest science minds of the age) and many others, including two nobel prize winning physicists. 2). Scepticism about the temperature record itself. Exposed by Steve McIntyre, Andrew Montford and the USA's top statistician Edward Wegeman. Particularly in relation to the so called hockey stick by Michael Mann and his team, along with Real Climate connected scientists which sought to hide the fact that it was warmer in medieval times than it is now. The Real Climate website was set up to defend the hockey stick, a direct attack on the principles of scientific objectivity. Gavin Schmidt, the creator is an employee of NASA GISS, in the same department as James Hansen is head. 3) Professor Phil Jones of UEA wrote that the rate of warming in the late twentieth century is the same as it was in the late ninteenth century. Between that and the medieval warm period, the picture that emerges is that current temperatures are not exceptional..
4) The climategate emails clearly revealed the major players in the climate science community to be involved in a Richard Nixon style campaign of dirty tricks against what they regarded as their opponents. That is not science, that is tribal warfare and corrupt practice. 5) The manipulative nature of the IPCC process itself and its reliance on information from environmental pressure groups like WWF and Greenpeace. 6) The total support of a corporate media propaganda campaign funded by advertising from beneficiaries of climate policy. Namely the carbon trading industry, a multi trillion dollar financial scam invented by Enron and supported by BP, Conoco Philips, Shell, E.ON, EDF, Gazprom, Goldman Sachs, Barclays, JP Morgan Chase, Morgan Stanley. See the finance page. First, the computer models are very good at solving the equations of fluid dynamics but very bad at describing the real world. The real world is full of things like clouds and vegetation and soil and dust which the models describe very poorly. Second, we do not know whether the recent changes in climate are on balance doing more harm than good. The strongest warming is in cold places like Greenland. More people die from cold in winter than die from heat in summer. Third, there are many other causes of climate change besides human activities, as we know from studying the past. Fourth, the carbon dioxide in the atmosphere is strongly coupled with other carbon reservoirs in the biosphere, vegetation and top-soil, which are as large or larger. It is misleading to consider only the atmosphere and ocean, as the climate models do, and ignore the other reservoirs. Fifth, the biological effects of CO2 in the atmosphere are beneficial, both to food crops and to natural vegetation. The biological effects are better known and probably more important than the climatic effects. Sixth, summing up the other five reasons, the climate of the earth is an immensely complicated system and nobody is close to understanding it. I am saying that all predictions concerning climate are highly uncertain. On the other hand, the remedies proposed by the experts are enormously costly and damaging, especially to China and other developing countries. On a smaller scale, we have seen great harm done to poor people around the world by the conversion of maize from a food crop to an energy crop. This harm resulted directly from the political alliance between American farmers and global-warming politicians. Unfortunately the global warming hysteria, as I see it, is driven by politics more than by science. If it happens that I am wrong and the climate experts are right, it is still true that the remedies are far worse than the disease that they claim to cure. You complain that people who are sceptical about the party line do not agree about other things. Why should we agree? The whole point of science is to encourage disagreement and keep an open mind. That is why I blame The Independent for seriously misleading your readers. You give them the party line and discourage them from disagreeing. 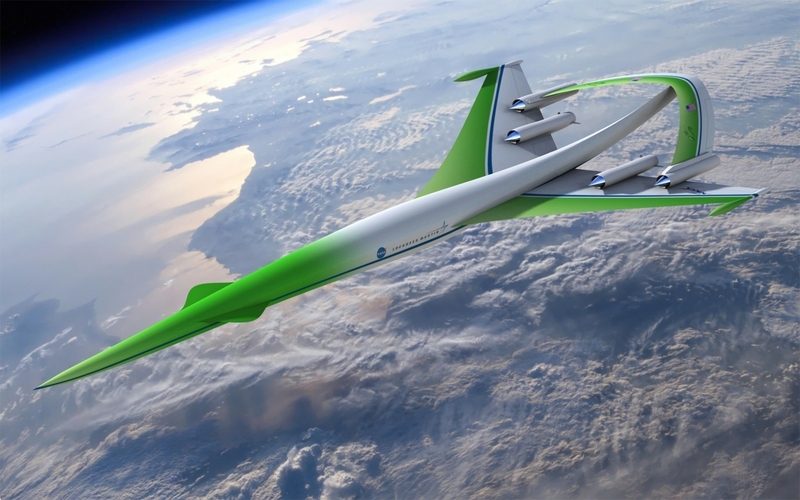 Please note that 0.12C per decade is not enough to require any CO2 reduction. Do you agree that according to the global temperature record used by the IPCC, the rates of global warming from 1860-1880, 1910-1940 and 1975-1998 were identical? People have asked why mainstream scientists are keeping silent on these issues. As a scientist who has largely kept silent, at least in public, I have more sympathy for silence than most people here. It’s not for the obvious reason, that speaking out leads to immediate attacks, not just from Gavin and friends, but also from some of the more excitable commentators here. Far more importantly most scientists are reluctant to speak out on topics which are not their field. We tend to trust our colleagues, perhaps unreasonably so, and are also well aware that most scientific questions are considerably more complex than outsiders think, and that it is entirely possible that we have missed some subtle but critical point. However, “hide the decline” is an entirely different matter. This is not a complicated technical matter on which reasonable people can disagree: it is a straightforward and blatant breach of the fundamental principles of honesty and self-criticism that lie at the heart of all true science. The significance of the divergence problem is immediately obvious, and seeking to hide it is quite simply wrong. The recent public statements by supposed leaders of UK science, declaring that hiding the decline is standard scientific practice are on a par with declarations that black is white and up is down. I don’t know who they think they are speaking for, but they certainly aren’t speaking for me. The decision to hide the decline, and the dogged refusal to admit that this was an error, has endangered the credibility of the whole of climate science. If the rot is not stopped then the credibility of the whole of science will eventually come into question. Judy’s decision to try to call a halt to this mess before it’s too late is brave and good. So please cut her some slack; she has more than enough problems to deal with at the moment. Some people were soeager to prove this point that it became more important than scientific integrity.The next step was to show that this “unprecedented high current temperature” has to be a result of the increasing atmospheric concentration of carbon dioxide from the burning of fossil fuels. Thus, two of the three pillars of the global warming and carbon dioxide paradigm are open to reinvestigation.The damage has been done. The public trust in climate science has been eroded. At least a part of the IPCC 2007 report has been put in question. We cannot blame it on a few irresponsible individuals. The entire esteemed climate research community has to take responsibility. Chylek has published over 100 scientific papers in remote sensing, atmospheric radiation, climate change, cloud and aerosol physics, applied laser physics and ice core analysis. His work has been cited more than 3000 times. Chylek is best known for his work in remote sensing, water vapor, aerosols and their relation to climate change. Nevertheless, the policy cart was put before the scientific horse, justified by the precautionary principle. Once the UNFCCC treaty was a done deal, the IPCC and its scientific conclusions were set on a track to become a self fulfilling prophecy. The entire framing of the IPCC was designed around identifying sufficient evidence so that the human-induced greenhouse warming could be declared unequivocal, and so providing the rationale for developing the political will to implement and enforce carbon stabilization targets. National and international science programs were funded to support the IPCC objectives. What should have been a political debate about energy policy, environmental quality, and reducing vulnerability to weather and climate disasters, became a debate about the nuances of climate science, with climate scientists as the pawns and whipping boys. So were the scientists innocent victims and pawns in all this? Were they just hardworking scientists doing their best to address the impossible expectations of the policy makers? Well, many of them were. However, at the heart of the IPCC is a cadre of scientists whose careers have been made by the IPCC. These scientists have used the IPCC to jump the normal meritocracy process by which scientists achieve influence over the politics of science and policy. Not only has this brought some relatively unknown, inexperienced and possibly dubious people into positions of influence, but these people become vested in protecting the IPCC, which has become central to their own career and legitimizes playing power politics with their expertise. I remember when the Americans sent up a satellite to measure ozone and it started saying that a hole was developing over the South Pole. But the damn fool scientists were so mad on the models that they said the satellite must have a fault. We tend to now get carried away by our giant computer models. But they're not complete models. They're based more or less entirely on geophysics. They don't take into account the climate of the oceans to any great extent, or the responses of the living stuff on the planet. So I don't see how they can accurately predict the climate. there are some sceptics that I fully respect. Nigel Lawson is one. He writes sensibly and well. Steven Goddard,’ the man behind ‘Real Science,’ a prominent anti-global warming blog, admits his real identity is Tony Heller, a former US government climate modeler. Heller broke the astonishing news on his website (June 27, 2014) declaring he is a life-long committed environmentalist sickened by the orchestrated campaign of misinformation pumped out by governments. But without doubt the greatest of Heller's revelations from the climate modelling community is that it is well known by insiders that increases in levels of atmospheric carbon dioxide will not cause global warming. He explains, “The radiative transfer models used by government climate scientists show that going up to 550 PPM or even 1000 PPM CO2 will make minimal difference to the radiative balance of the atmosphere. The knee of the CO2 curve is at about 30 PPM, and additional CO2 has little first order effect. This is because almost all radiation in the CO2 absorption spectra is already being absorbed by H2O or CO2 molecules. Roger Pielke senior severely critiquing a multi-decadal climate model projections paper on basic methodology. I was amazed really by the inadequacy of what we had, because we’re talking about climate change which is over tens of thousands of years as opposed to the twenty years of data that we had. So in a way we were putting out a lot of ideas and not really having concrete scientific research to support it, and I suppose at that point I did lose a little bit of my spark, thinking well I could propose an idea and I could probably draft a thesis that would support it and yet I wouldn’t really convince myself necessarily. The chief of the world's leading physics lab at CERN in Geneva has prohibited scientists from drawing conclusions from a major experiment. The CLOUD ("Cosmics Leaving Outdoor Droplets") experiment examines the role that energetic particles from deep space play in cloud formation. CLOUD uses CERN's proton synchrotron to examine nucleation. "I have asked the colleagues to present the results clearly, but not to interpret them,"
The effect of using “all the data to hand” is potentially quite dramatic. 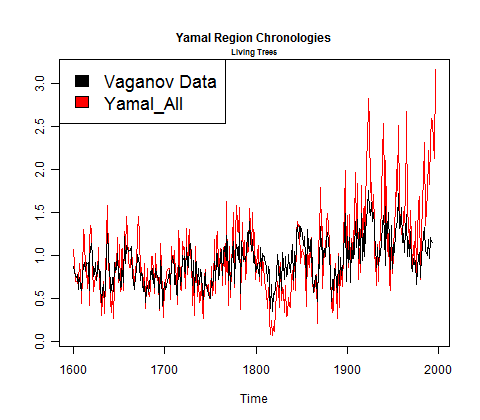 The graphic below compares the Briffa 2009 chronology (red) to the average of site RCS chronologies for the 20 Vaganov sites in the 10-degree box. As you can see, there is considerable correlation between the two chronologies, though the Briffa version is spikier than the much larger Vaganov network. The discrepancy becomes very pronounced from the 1970s on – the Vagnov network shows the characteristic “decline” in the late 20th century that also characterized the large Schweingruber network, while the Briffa Limited Hangout network surges to new records. Figure 4. Comparison of Briffa 2009 chronology and regional chronology from Vaganov data. A review of the practices of the Intergovernmental Panel on Climate Change (IPCC) has been conducted in response to intense criticism of the body, whose reports are used by governments to inform policy decisions on global warming. The findings of the review are due to be handed to the UN Secretary General Ban Ki-moon tomorrow. Conducted by a committee of representatives from the world's leading scientific bodies, the analysis is expected to recommend a number of changes to the way the IPCC compiles and checks its extensive 1,000 page reports. The committee, which is made up of scientific organisations that form the InterAcademy Council, is also expected to recommend changes to help the IPCC keep its reports, which take around six years to complete, more up to date with current science. Evidence given to the committee has also called for a tightening of the way facts and references are checked before the reports are published. The IPCC has been under scrutiny after it admitted making an error in its 2007 report, that stated Himalayan glaciers could melt to a fifth of current levels by 2035 – a statement that was wrong by over 300 years. The panel has also been criticised over the sources of information it used to compile the report after a number of statements were found to be based on information taken from reports by environmental lobby groups, magazine articles and student dissertations. In sum, a strategy must recognise what is possible. In climate research and modelling, we should recognise that we are dealing with a coupled non-linear chaotic system, and therefore that the long-term prediction of future climate states is not possible. The most we can expect to achieve is the prediction of the probability distribution of the system's future possible states by the generation of ensembles of model solutions. This reduces climate change to the discernment of significant differences in the statistics of such ensembles. The generation of such model ensembles will require the dedication of greatly increased computer resources and the application of new methods of model diagnosis. Addressing adequately the statistical nature of climate is computationally intensive, but such statistical information is essential. In fact, a prominent UN scientist questioned the reliability of such climate models. In a recent candid statement, IPCC scientist Dr. Jim Renwick—a lead author of the IPCC 4th Assessment Report—publicly admitted that the computer models that predict a coming catastrophe may not be so reliable after all. Renwick stated, "Half of the variability in the climate system is not predictable, so we don't expect to do terrifically well." Let me repeat: a UN scientist admitted, "Half of the variability in the climate system is not predictable." A leading scientific skeptic, meteorologist Dr. Hendrik Tennekes, a scientific pioneer in the development of numerical weather prediction and former director of research at The Netherlands' Royal National Meteorological Institute, recently took the critique of climate computer models one step further. Tennekes said in February 2007, "I am of the opinion that most scientists engaged in the design, development, and tuning of climate models are in fact software engineers. They are unlicensed, hence unqualified to sell their products to society."